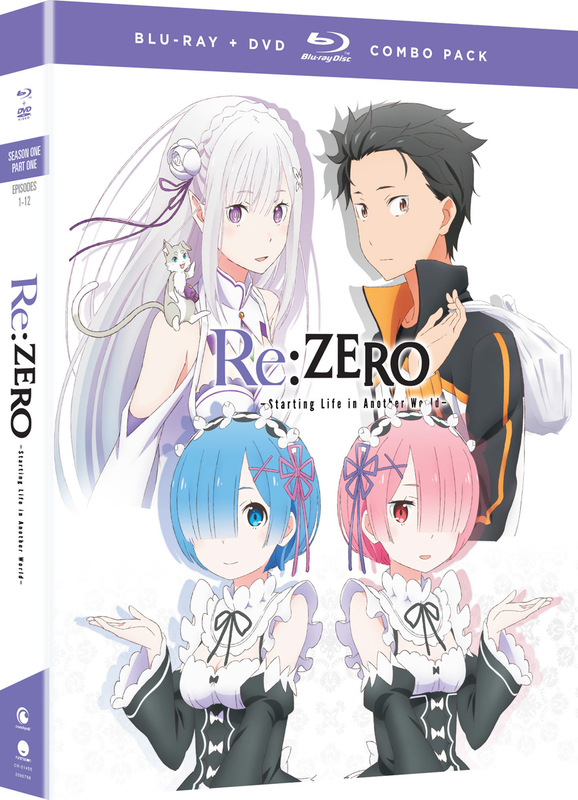 Re:ZERO ~Starting Life in Another World~ Season 1 Part 1 contains episodes 1-12 of the anime series directed by Masaharu Watanabe. After being suddenly transported to another world, Natsuki Subaru discovers a terrible truth-he can't die. Or rather, he can't remain dead. With this terrifying new ability, he experiences reset after reset and it begins to take its toll on his mental state. But, determined to protect his new friends and the woman he's fallen in love with, Subaru suffers to save. 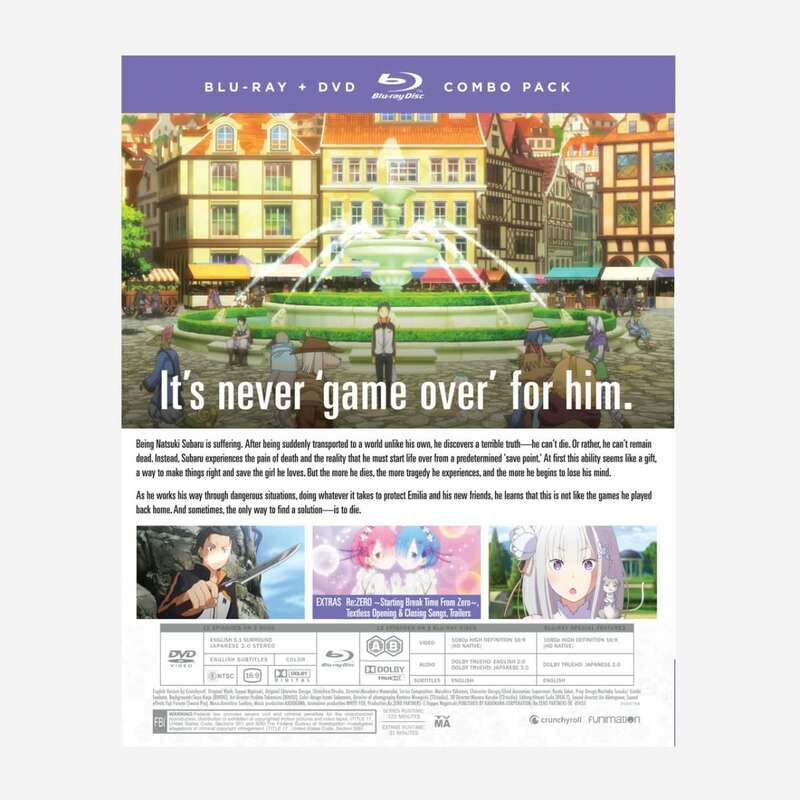 I’m sure we are not allowed to link to other sites in reviews so in a search engine type in, “re zero blu ray issue” and it’s all there both videos and forums talking about it. This hasn’t nothing to do with Rightstuf - it’s a FUNimation issue. This show deserves so much better than this, and blu ray should never look worse than a subpar stream. Hopefully FUNi does something about this. Let me start out by saying I love this show. If I was reviewing the show alone, I would almost definitely give it 5 stars. However, this Blu-ray release has left me disappointed. When I was watching it, I noticed slight color banding in some scenes, but I blamed that on the old rear projection TV I was using. Out of curiosity, I tried it on another TV, and the problem persisted. After some research, it seems like this isn't just my discs, but likely all of them. So far I haven't heard anything about possible replacements. The show is still excellent, but be warned that the video quality may not be what you're paying for (especially because the season is being split into 2 sets). I put off watching this Isekai for a while, but was really surprised at how good it was. Not many shows in Anime take the time to fill in tons of backstory or work on complicated character arcs. Show deserves a solid 4 or 5 star rating, but not everyone likes the drama.